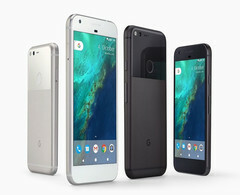 Google has uploaded factory images for their Pixel and Pixel XL smartphones, that are available in the Unites States and Canada since yesterday. Thanks to an unlockable bootloader in the free version available in the Google store, you can not only install alternative firmware like Cyanogen Mod, once it is available for the Pixel Phones but also easily revert to the stock firmware by reinstaling the factory images. Pixel Phones sold by Verizon unfortunately have their bootloader locked. The factory images are available on Google's Nexus developer site here, together with instructions on how to install them. Google also released their first update for the Pixel and Pixel XL, which can be installed over the air (OTA). It is said to fix some WiFi connection issues and can also be installed using OTA images on the Nexus developer pages. We have started our Live-Test of the Pixel XL and will update our test pages regularily. Be sure to check in from time to time if you are interested in this device. We also put together a collection of reviews by other magazines and sites for the Pixel and Pixel XL. Check them out!